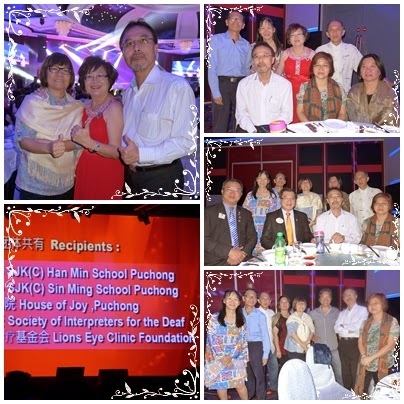 22/3/2015 Attended by President Yvonne, Lynda, Adelene, Jessie with her friends Jessie Choi and Cindy Tan. 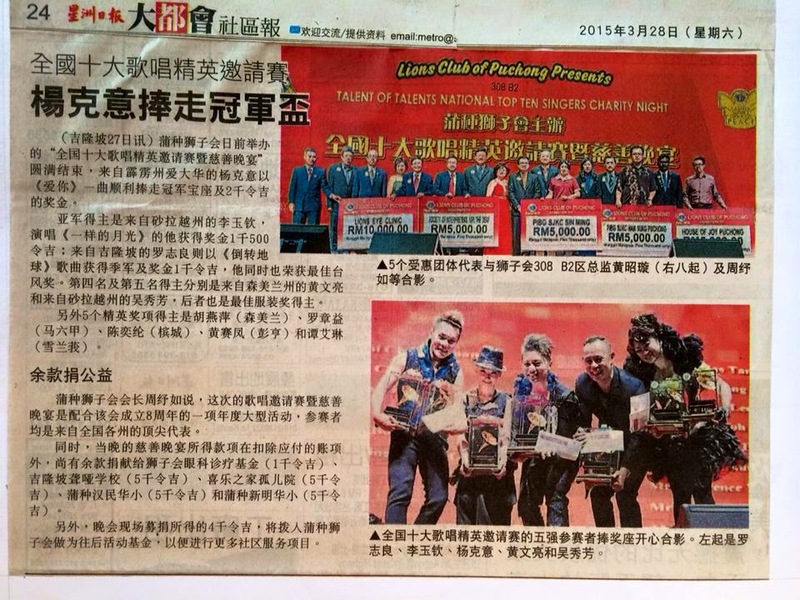 An absolutely extravaganza Charity Show of the year by LC Puchong. 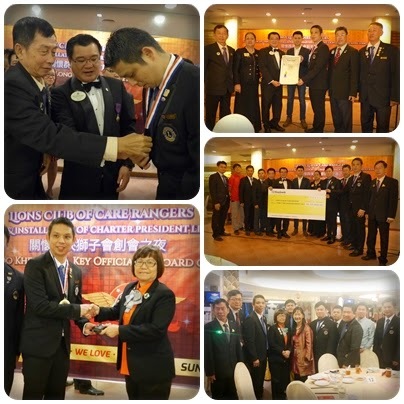 Congratulations to Charter President Dato' Foo Khee Long, Charter Secretary Lion Lim Kian Boon, Charter Treasurer Dato' Lim Kian Seong and Board of Directors on your successful Charter Night of Lions Club of Puchong Care Rangers held at Hee Lai Ton Puchong on 8 March 2015. 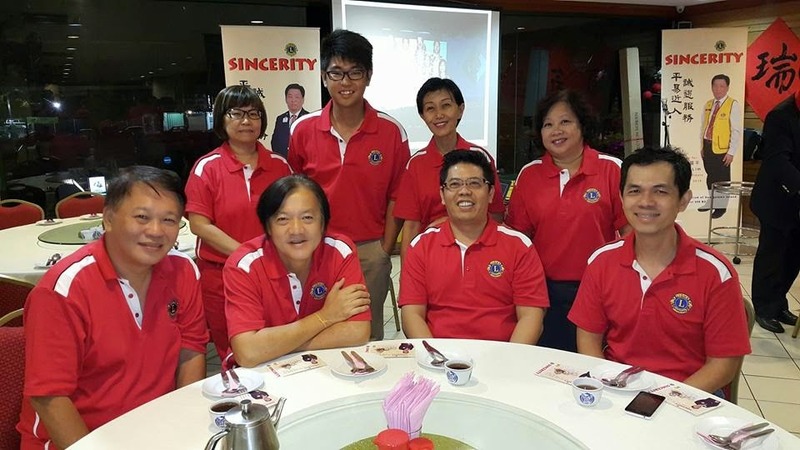 Their VIP is MCA Youth Chief YB Senator Chong Sin Woon, GOH PID Hajjah Ellis Suriyati, DG Ooi Chao Shyuan, 1st VDG SN Tai and various PDGs and Cabinet Officers. 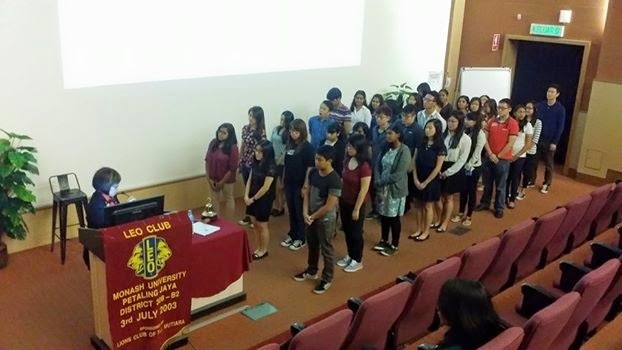 Induction of Charter Members was conducted by 1st Vice District Governor S.N. Tai. 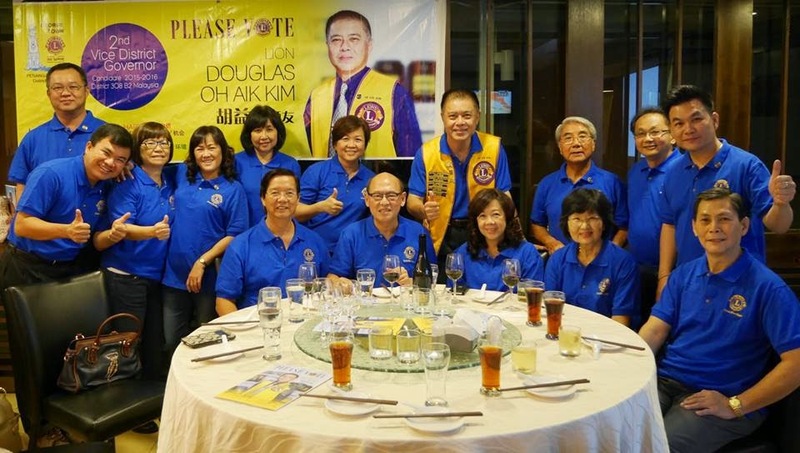 Ceremonial wearing of Club Vest done by Lions from LC Kampar, their sponsoring Lions Club and receiving their Certificate of Membership from 1st VDG, S.N. 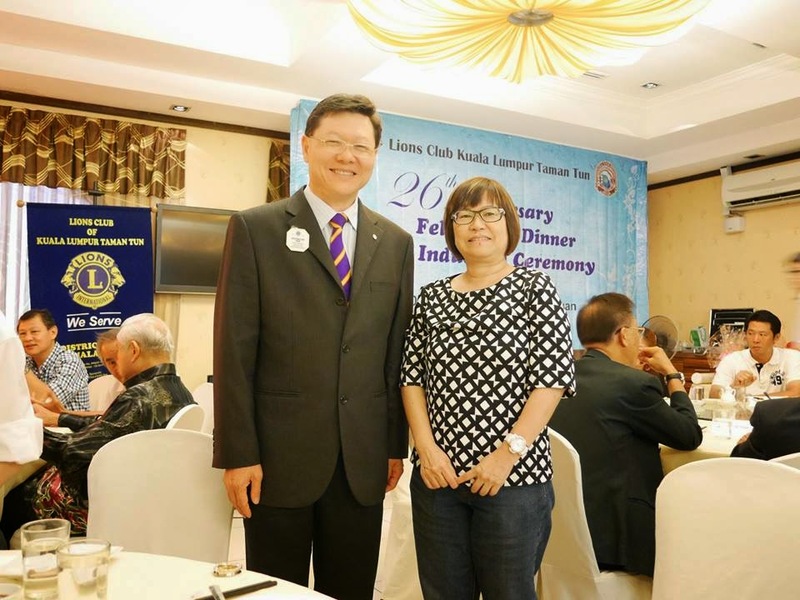 Tai witnessed by DG Ooi. 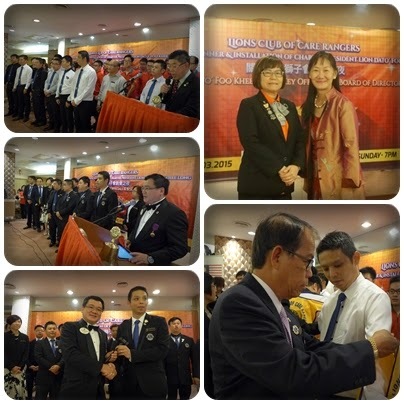 Installation was conducted by DG Ooi, followed by placing the President insignia by their sponsoring President Chow Hon Seng and DG handed the Gavel to President Dato Foo. 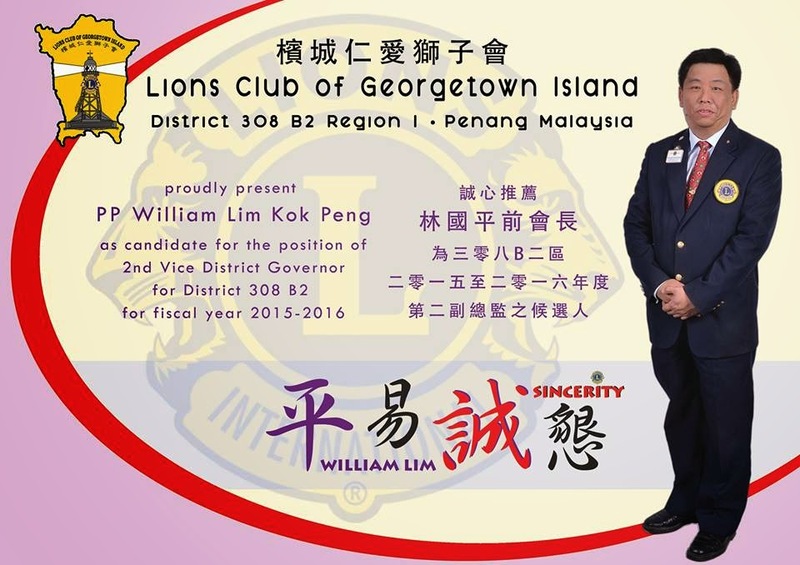 Presentation of LCI Certificate witnessed by VIP and Guests and presentation of mock cheque of RM32,000 raised for their club project fund. 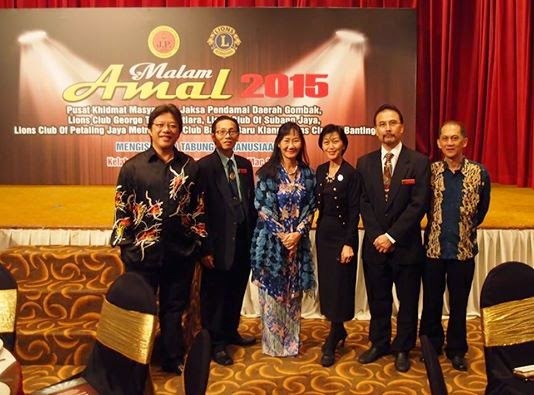 Malam Amal jointly organised with Justice of Peace Selangor and LC George Town Mutiara. 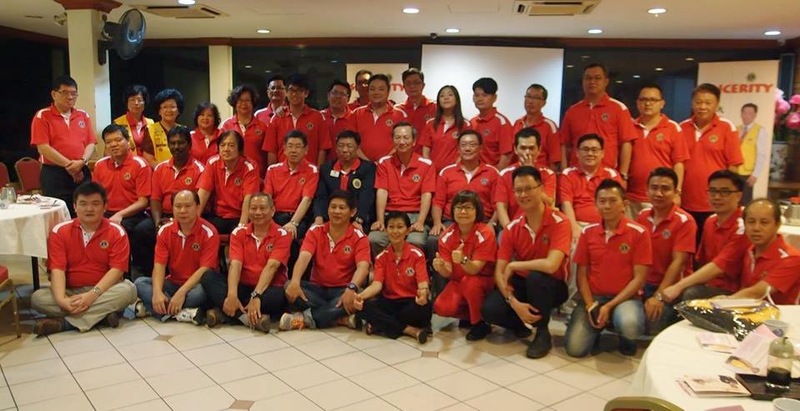 LC PJ Metro, LC Subang Jaya, LC Bandar Baru Klang and LC Banting held at Kelab Shah Alam on 7 March 2015 attended by Z16C Jessie Ng and Secretary Irene Hoi. 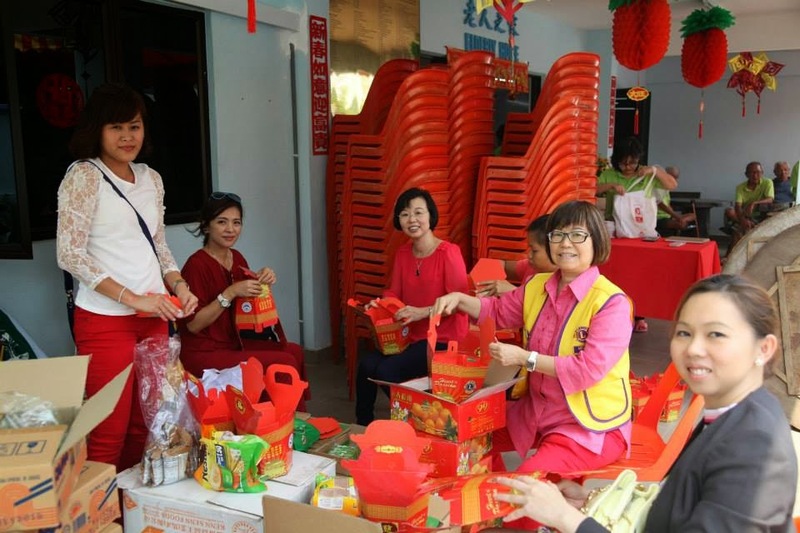 The Lions Club of Petaling Jaya Mutiara and Club Branch Petaling Jaya Central jointly organized a Chinese New Year Luncheon for 160 senior citizens and children from 9 homes namely  20 pax House of Joy, 30 pax Rumah Victory. 30 pax Rumah Charis, 20 pax Rumah Kanak-Kanak Angel, 10 pax Rumah Cempaka, 10 pax Little Sisters of the Poor, 10 pax Bodhi Homecare, 10 pax Persatuan Rumah Caring and  20 pax Loving Nursing Home. 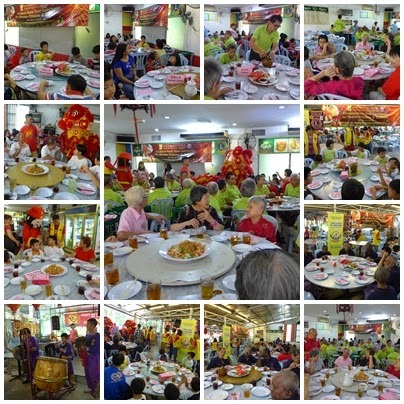 The lunch was held on Sunday, 8 March 2015 at Restoran 88, 15 Jalan Batalong, Continental Park, Off Jalan Kuchai Lama, Kuala Lumpur from 11.30am to 3.00pm. 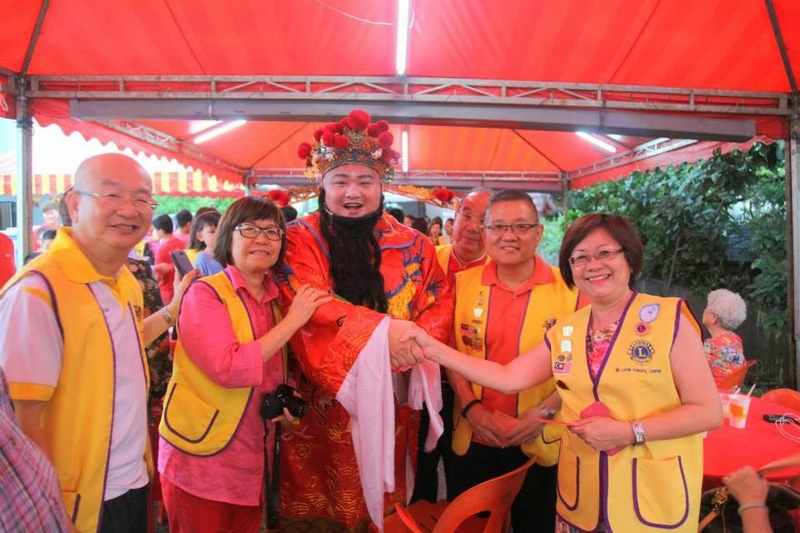 The event started with the performance by a pair of red and gold Lion, the dance troupe from Xu Yang Lion that went round from table to table ‘greeting’ the senior citizens and children. 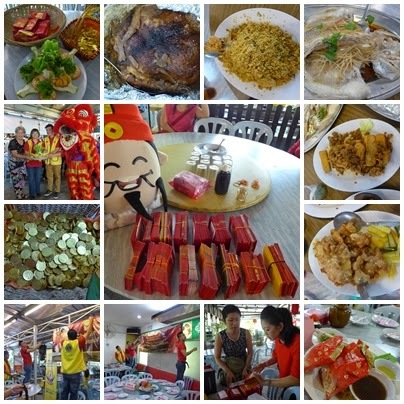 It was an exciting start to a sumptuous 8-course lunch served by the efficient staffs of Restoran 88. 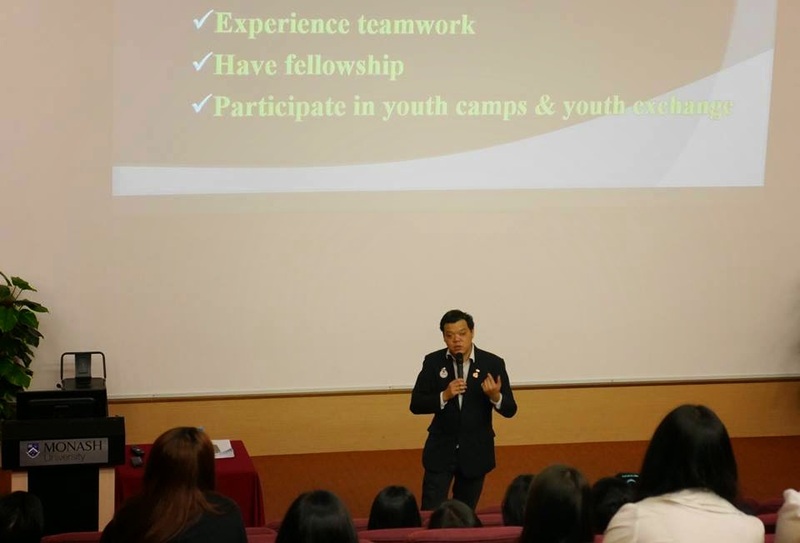 The highlight of the afternoon was the distribution of angpows. 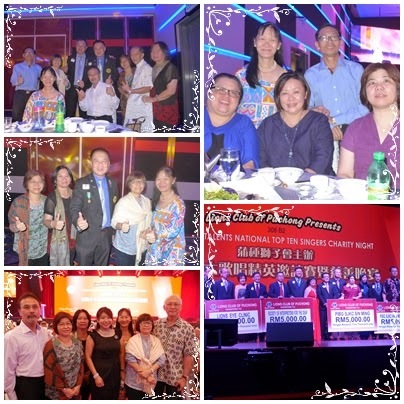 The senior citizens and children had a “fund-erful” afternoon receiving so many angpows courtesy of the many donors that had generously contributed to the event. 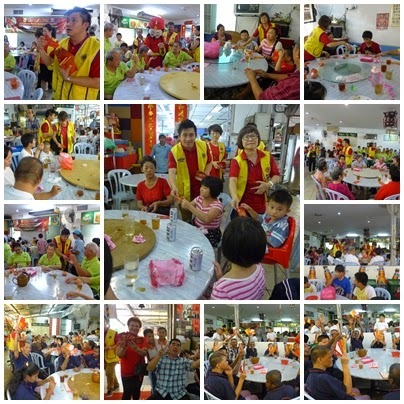 In addition to the lunch, the senior citizens and children were entertained to Chinese New Year songs by the clubs’ members. Albeit a small stage, all had a wonderful time singing and dancing on the stage joined in by a senior who loves dancing and some children. It is very pleasing to see the happy faces of the senior citizens and children as the members bade them farewell after the event. 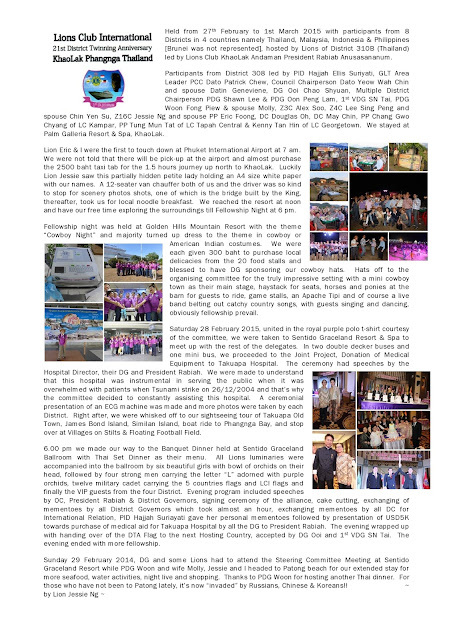 The two clubs look forward to organizing a similar event next year and many more years to come. 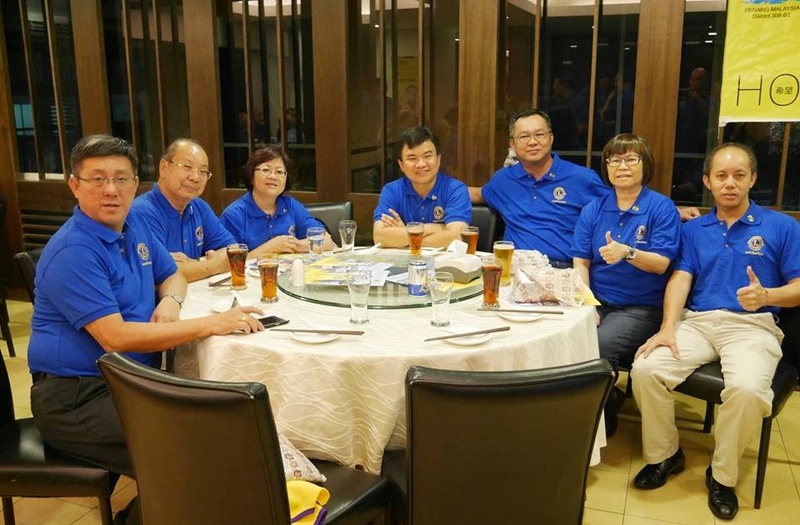 6 March 2015 Z16C Lion Jessie Ng did presentation of DG Ooi Chao Syhuan Blue Sapphire Outstanding Attendance Pins Recipients for 2nd quarter : LC PJ Mutiara President Lion Yvonne Cheong Secretary CP Lynda Yeng, Treasurer PP Irene Hoi, PP Nelson Wong, PP Loo Chwee Chin, PP Josephine Yeng, PP Nancy Soh, yours turlly and from Club Branch PJ Central Secretary Danny Liew. 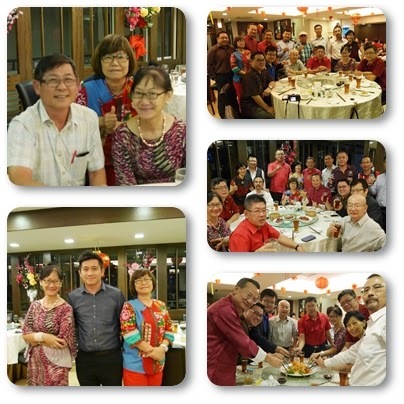 President Yvonne attended the CNY Project organised by LC Subang Jaya on 26 February 2015 at Rumah Victory, Kuala Lumpur. 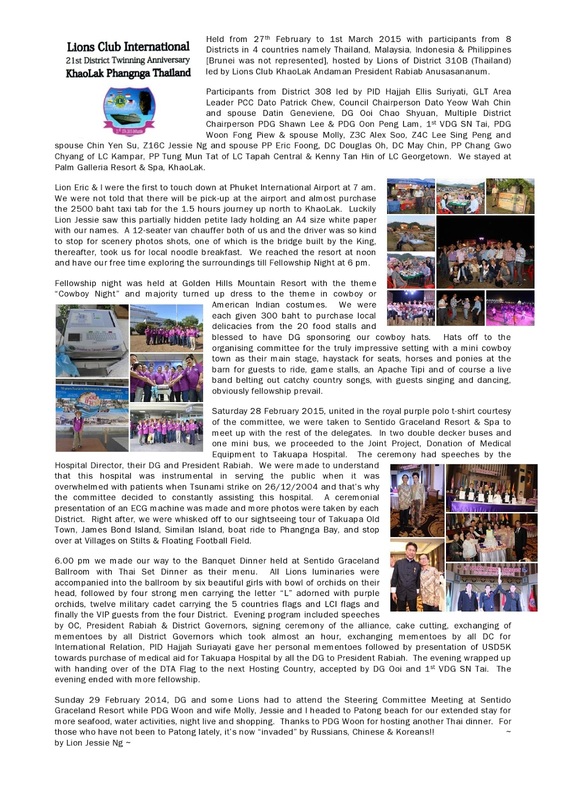 21st District Twinning Anniversary held at KhaoLak Phangna Thailand from 27th February to 1st March was participated by Z16C PP Jessie Ng with 16 other Lions from District 308B2 headed by DG Ooi Chao Syhuan, GLT Area Leader PCC Dato Patrick Chew, Multiple DC PDG Shaw Lee, Multiple DC PDG Oon Peng Lam, 1st VDG SN Tai, PDG Woon Fong Piew & wife Molly, ZC Alex Soo, ZC Lee Sing Peng and wife Chin Yen Su, DC May Chin, DC Douglas Oh, PP Eric Foong of LC PJ Metro, PP Chang Gwo Chyang of LC Kampar, PP Tung Mun Tat of LC Tapah Cenral & Kenny Tan Hin of Georgetown. 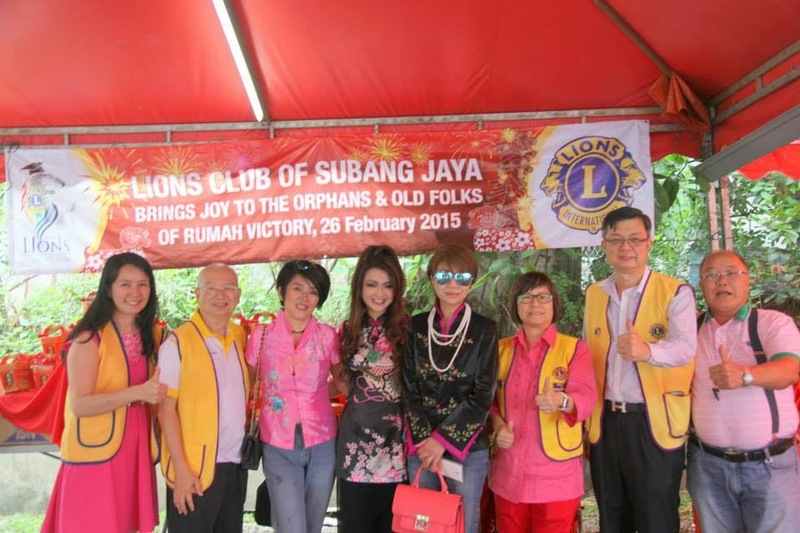 Other participants included Lions from Indonesia, Philippines, Brunei & Thailand. 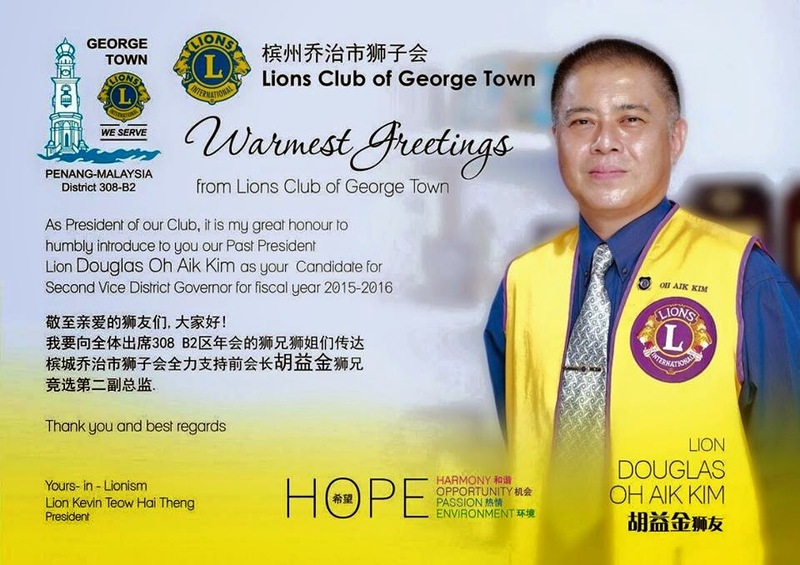 It was hosted by Lions Club of KhaoLak Andaman headed by President Rabiab Anusasananun. 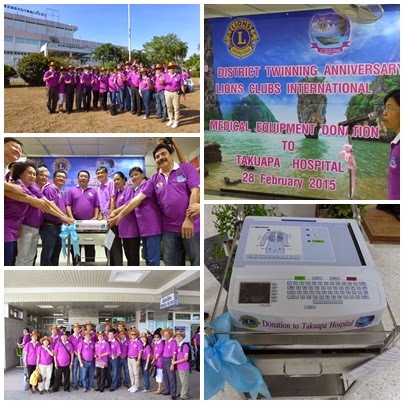 28 February 2015 we gathered at Takuapa Hospital to witness the presentation of an ECG machine to Takuapa Hospital. 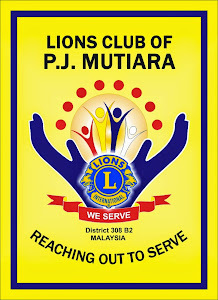 Two bus loads of Lions were received by the Director and hosted with tea for us. We were briefed on the hospital followed by speeches by various Lions and than all the DG's did a presentation. The whole event lasted 2 hours. 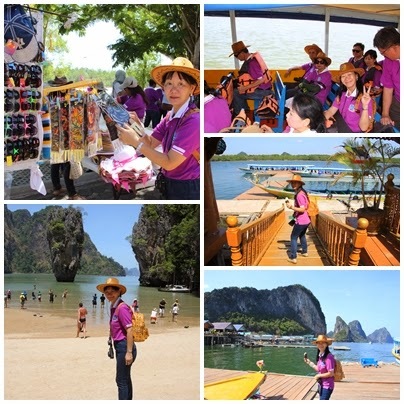 Thereafter, we proceeded for our half day Sightseeing Tour of PhangNga Bay, Southern Thailand. Packed lunch was served on board the ferry to save time while we cruise for half an hour to the famous James Bond Island, village on stilts, floating football field. 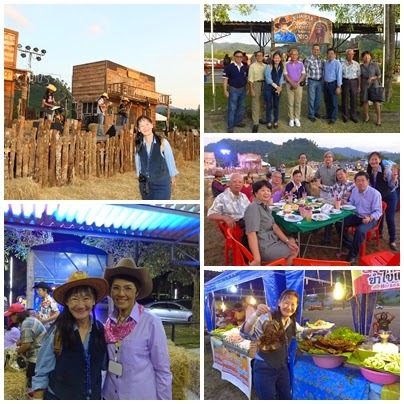 The whole tour ended at 4 pm and headed back to hotel to prepare of the Banquet Night. 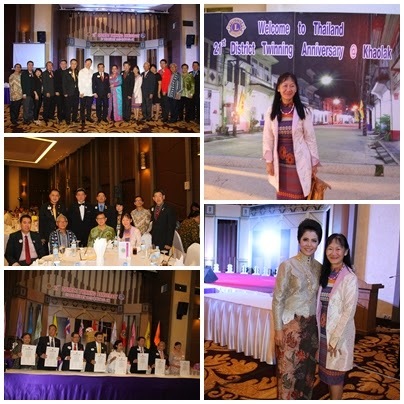 The official event was the DTA Banquet Dinner serving Thai Menu Set Dinner. Opening ceremony saw Thai girls parading with flowers and handsome man carrying the letter "L" adorned with purple orchids followed by military youth carrying the Flags of Participating Countries and LCI flags. Lots of exchanging of gifts among the District Governor, DC of International Relations & VDGs and Signing Ceremony of this Alliance which lasted 2 hours. 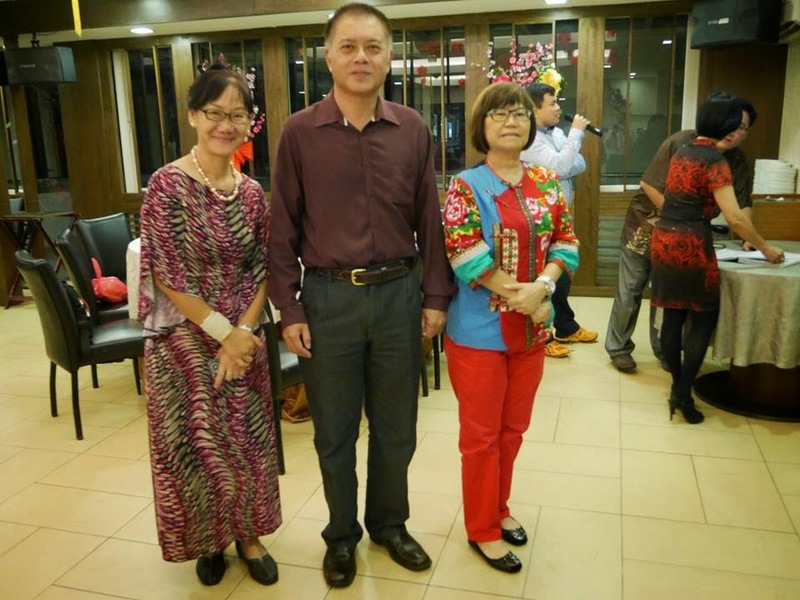 Presentation of USD500 cash to President Rabiah and ended with guests dancing to "loy ka tong". 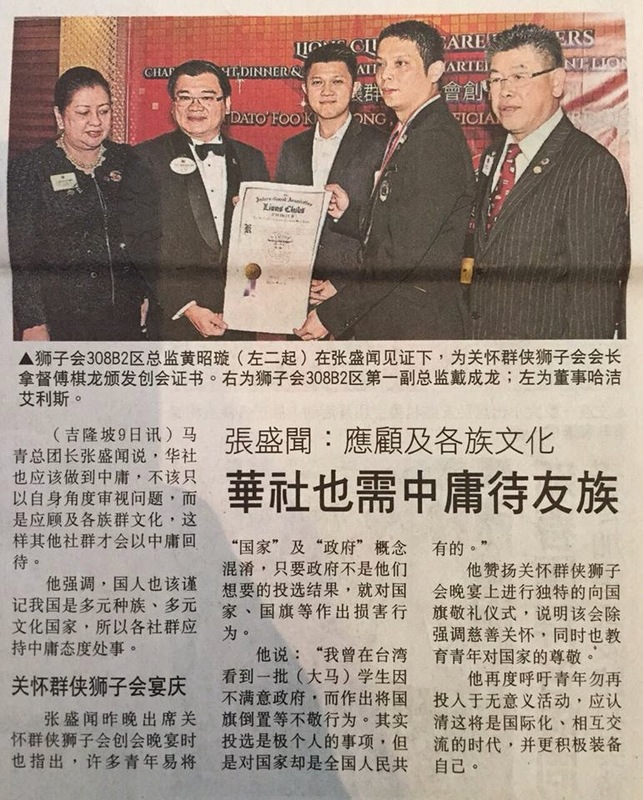 The 22nd DTA will be hosted by Selangor Malaysia in 2016. 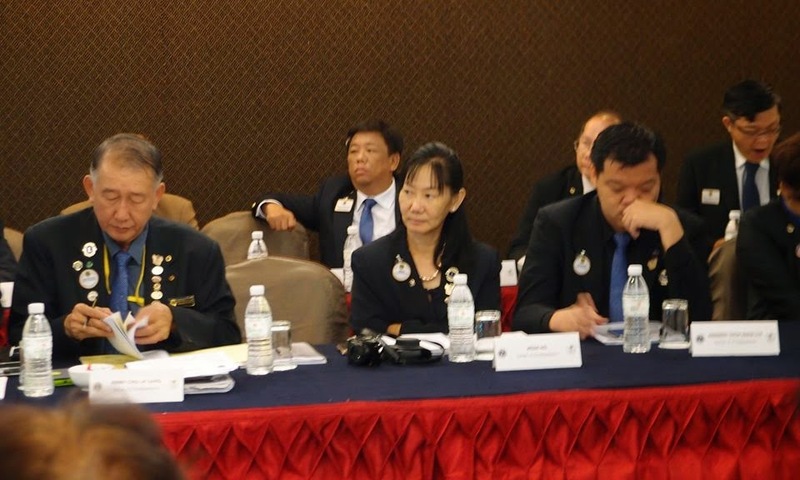 Some Lions had to attend the Steering Committee Meeting at Sentido Graceland Hotel while Eric and I with PDG Woon and wife Molly headed to Patong Beach for our extended stay of more seafood, tan bodies, sea activities, eye opening adventurous night life. 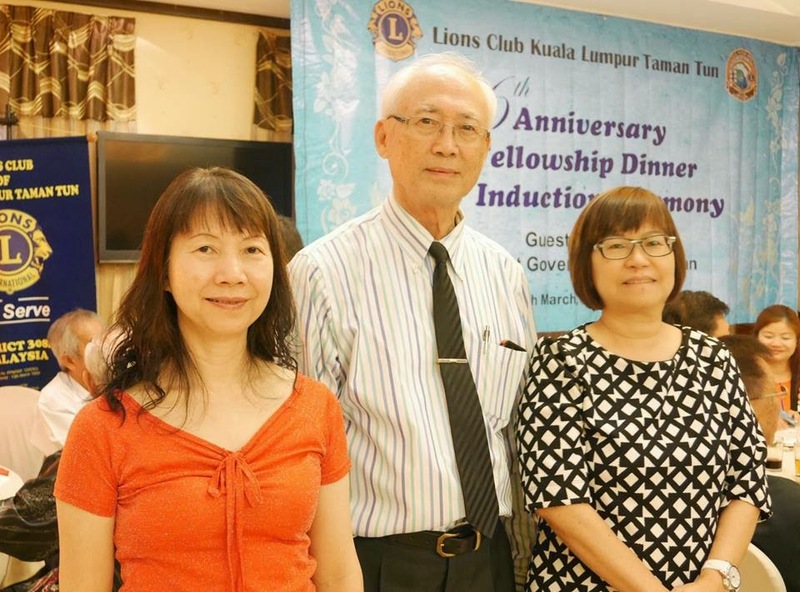 Thanks to PDG Woon for hosting another Thai dinner too. 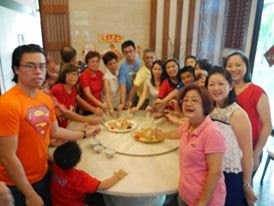 CNY Fellowship at President Yvonne's residence whom only Irene, Laticia and Tracy were available to join in, while the rest had own gathering.